Last weekend there was a festival at Freshwater, on Sydney’s northern beaches, in honour of Hawaiian surfer Duke Kahanamoku. A century ago, Duke introduced surfing to Australia, riding a board he fashioned from Sydney timber on Christmas Eve, 1914. It was so popular that he gave a second demonstration on January 10 1915. It was Australian swimmer Cecil Healy who brought Duke here. Cecil was one of Australia’s greatest competitive swimmers at the turn of the twentieth century, saving numerous people from drowning as a surf lifesaver, touring Europe to demonstrate the daring new “crawl” stroke, and competing in the earliest modern Olympic Games. At the 1912 Games in Stockholm, Cecil and Duke both qualified for the semi-finals in the 100 metre event, but because the American team missed the bus, none of the US swimmers qualified for the finals. Cecil intervened, and helped the Americans appeal: because of his assistance, the Americans were allowed to swim another race, and Duke qualified for the finals. In the final, Duke won easily, and Cecil came second. His good sportsmanship had cost Cecil a gold medal, but it gained him a friend. When Cecil invited Duke to come to Australia and give swimming and surfing exhibitions, he could hardly refuse. Just two years after introducing surfing to California, Duke was at Freshwater to demonstrate the Hawaiian sport. The crowd went wild, and in a heartbeat, Australia’s love affair with surfing had begun. Today Freshwater boasts the title Home of Australian Surfing. Duke’s board is on display at the Freshwater Surf Life Saving Club, and there is a bronze statue of Duke Kahanamoku on the headland at Freshwater. 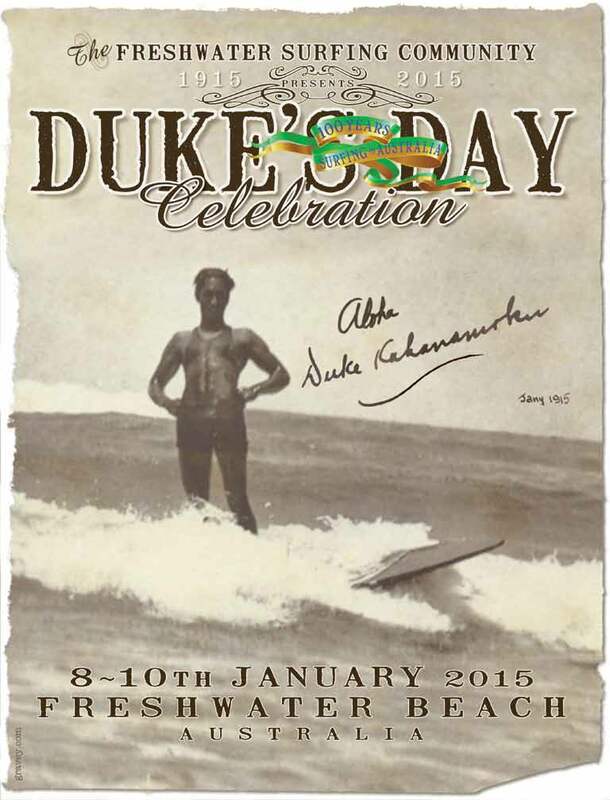 Freshwater is a sister city to Waikiki in Honolulu, and every year it celebrates Duke’s Day, to honour the Hawaiian athlete who made such a huge contribution to Australian culture. Duke Kahanamoku continued to win Olympic medals, and later became a Hollywood actor. In 1940, he married Nadine Alexander, an American dancer whose mother had been an opera singer from South Australia. Sadly, Cecil Healy was killed on the Somme in 1918, the only Australian gold medal-winning Olympian to die in battle. Duke is an aristocratic title, traditionally the highest rank of the nobility, just below a monarch. Dukes can also rule their own countries as monarchs, but today there is only one ruling duke – His Royal Highness Henri, Grand Duke of Luxembourg. Although we usually think of dukes as being male, Queen Elizabeth is both Duke of Normandy and Duke of Lancaster. The word comes from the Latin dux, meaning “leader”. It could be given to a military commander, and also governors of provinces. Later it meant the highest-ranking military officer in a province. As a slang term, the dukes are the fists, and thus “to duke it out” means to settle a score using your fists. This is probably from Cockney rhyming slang, where Duke of York means “fork”; fork is Cockney slang for “hand”, because they have a similar shape. The surname Duke could have been given to someone who worked in a duke’s household or was part of his entourage, and as medieval dukes tended to have other nobles around them, many of the early Dukes were of aristocratic origins. The surname can also be derived from the Irish name Marmaduke, meaning “follower of Saint Maedoc”, and it has a long history in Ireland, especially Northern Ireland. Just as with the surname, Duke can be used as a nickname for the first name Marmaduke, however it is often bestowed or self-chosen as an honorific nickname. Jazz legend Edward “Duke” Ellington was given his nickname in childhood from his elegant manners. Hollywood star John Wayne (born Marion Morrison) also became known as Duke in childhood, because he was always in the company of his dog, Duke. Understandably he preferred Duke to his given name Marion, and when he started out as an actor tried using Duke Morrison as his screen name, but the producers preferred John Wayne. The Thin White Duke was one of David Bowie’s stage personae. Duke has been used as a personal name since at least the 16th century, and although it originated in England, has historically been more common in the United States. In case you were wondering, Duke Kahanamoku was named after his father, and Duke Kahanamoku Senior was given his name in honour of Prince Alfred, Duke of Edinburgh, who was visiting Hawaii in 1869. Duke has been on and off the US Top 1000 since 1880, and after a break of more than forty years, it returned in 2013 and is currently #718. In England/Wales, there were 21 baby boys named Duke last year. Duke can be found as a personal name in Australian historical records from the late 19th century onwards. It is much more common as a middle name, and as it was sometimes given to girls in this position, suggests it was inspired by the surname in many cases. It is often found as a common law nickname, and in one case at least, the baby was christened rather humorously, as his name was Duke Wellington. The name became problematic in Australia during the 1990s when name laws were introduced, because titles as names were not permitted. This wasn’t much of an issue at the time, as the numbers of parents wanting to call their sons Duke were few and far between – flourishing at the turn of the twentieth century, the name Duke was very much out of fashion back then. However, things have changed. Not only are vintage names firmly back in style, there have been a number of recent fictional Dukes to raise interest in the name, including Duke from GI Joe (played by Channing Tatum in the movies), Duke Crocker from supernatural drama Haven, Duke Nukem from the video games, and maybe even the Dukes of Hazzard, who got a big-screen outing. As a result, some parents have begun to chafe against this restriction, and in New South Wales, the name Duke was successfully challenged in 2009, so that it is now permitted in this state. Queensland has revealed that it has registered Duke as a baby name, and in South Australia the name Duke was registered 4 times last year. In Victoria, the name Duke was registered 8 times in 2012, and in Tasmania, Duke was registered twice in 2010. Some parents may still be avoiding the name in the belief it is outlawed (I have seen babies named Juke and Djuke in a possible attempt to circumvent the name laws), but all signs point to it being an accepted choice. So if you want to use this rather cool vintage name for your son – go for it! Duke received an approval rating of 52%. 22% of people thought the name Duke was strong and masculine, but 12% thought it was inappropriate because it was a title.